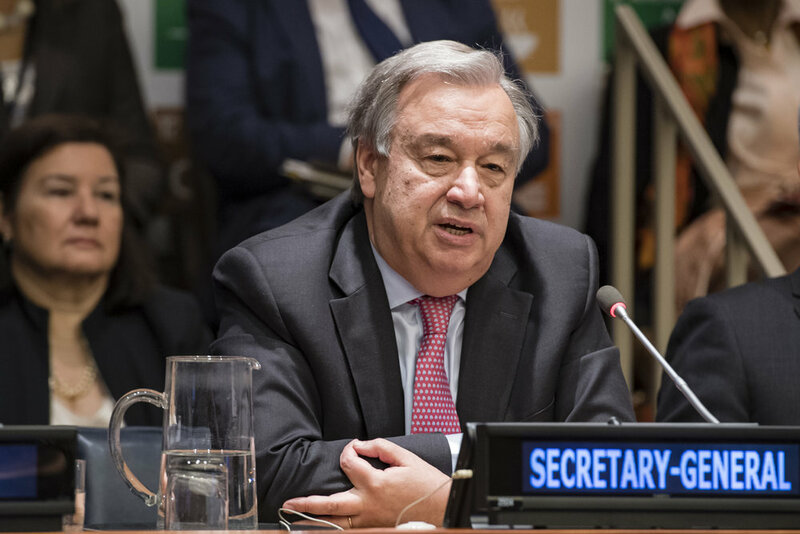 Secretary-General António Guterres makes remarks during the opening of the Ministerial segment of the High-Level Political Forum on Sustainable Development. Photo courtesy of UN Photo. Frederick Musiiwa Makamure Shava, President of the Economic and Social Council, makes remarks during the opening of the Ministerial segment of the High-Level Political Forum on Sustainable Development. Photo courtesy of UN Photo. A wide view of a session of the three-day ministerial segment of the High-Level Political Forum on Sustainable Development, convened under the auspices of the Economic and Social Council (ECOSOC). Photo courtesy of UN Photo. A meeting participant at the ministerial segment of the High-Level Political Forum on Sustainable Development, convened under the auspices of the Economic and Social Council (ECOSOC). Photo courtesy of UN Photo. In July 2018, Ireland will appear, for the first time, before the High-Level Political Forum (HLPF) on Sustainable Development - the body charged with monitoring progress towards the Sustainable Development Goals. Ireland will be called upon to account for what steps it has taken to implement the Goals and its future plans, both within Ireland and internationally. Held under the auspices of the United Nations Economic and Social Council (ECOSOC), the HLPF meets for eight days each year and focuses on a number of themes/SDGs which are discussed in broad, global terms. The focus of the 2018 event being “Transformation towards sustainable and resilient societies”. Each year a number of countries self-select to present their Voluntary National Reviews (VNR). In 2018, 47 countries, including Ireland, will give reports. Ireland’s Voluntary National Review Report, will be translated into the UN languages, and will be shared at the HLPF during a 13-minute presentation and a 15-minute Question and Answer session. In the sidelines of the Forum, many side events/meetings will take place, generally hosted by civil society organisations (some in partnership with governments) at which key thematic issues and policy ‘asks’ are discussed with representatives of various UN bodies and state missions. This is the third HLPF where countries have presented their VNRs. It must be recognised that, thus far, the HLPF has not been the robust accountability body civil society campaigned for in the run-up to agreement of the SDGs. The VNRs are, as the name suggests, voluntary, and so far many countries' reports have been weak on meaningful self-reflection or critique. Indeed, many have amounting to little more than optimistic PR exercises on the part of national governments, and there has been little effort by states to challenge the glaring omissions in them. As one of the co-facilitators of the negotiations to develop the SDGs, Ireland holds a particular responsibility to demonstrate leadership by ensuring that its own Voluntary National Review, which it will present in July 2018 is robust, critically self-reflective and representative of the views of civil society stakeholders. Despite broad recognition that the SDGs cannot be achieved without concerted attention to the myriad international and cross-border challenges that currently impede development, such issues have also been notable by their absence from dialogue. (Some of these, such as the continuing prevalence of tax havens and lackluster efforts to tackle greenhouse emissions, are particularly relevant to Ireland.) Space for civil society participation in the Forum meanwhile remains limited, though pressure is building (by governments and by civil society) for change in this area. With these facts in mind, the impact of the HLPF will depend on how effective NGOs and others are in pushing for ownership and meaningful implementation of Agenda 2030 at the national level. It is critically important, therefore, that civil society organisations stand together and work effectively to hold governments to account for the promises made in the SDGs. This will require incorporating the 2030 Agenda into all areas of our own work. It will mean using the SDGs – its targets and indicators – as a framework against which we measure progress against work undertaken by governments. Most importantly, civil society must succeed in promoting broad ownership of the SDGs both within our own organisations, and among the media, private sector and the general public. In this sense, effective civil society mobilisation around the HLPF is every bit as important as the monitoring and evaluation processes that take place within it.